Google's share price surpassed $800, as optimism about the company has never been higher. That's the exact opposite of Apple. NEW YORK ( TheStreet) -- Google ( GOOG - Get Report) and Apple ( AAPL - Get Report) have become polar opposites as of late, as Google's share price hits $800 for the first time, and Apple's freefall continues. Shares of the Internet search giant surpassed $800 in early Tuesday trading, amidst positive sentiment, reaching a high of $804 before pulling back slightly. Google, led by CEO Larry Page, can seemingly do no wrong now. That was the prevailing sentiment surrounding Apple for much of the last few years, but that's changed over the past three months. 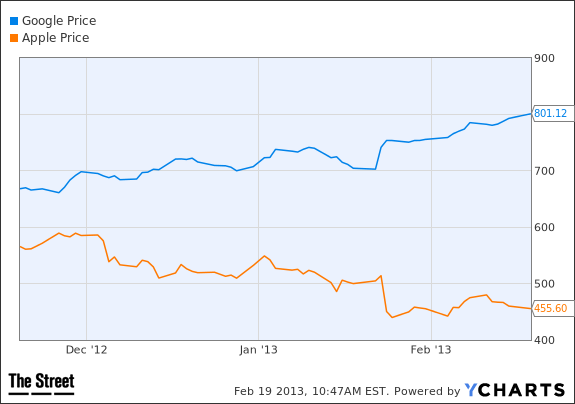 Shares of Google are up 20% over the past three months, whereas Apple's down 19%. Google's fourth-quarter results showed that cost-per-click (CPC), a key metric for ads, fell 6% year-over-year, but actually rose 2% sequentially, alleviating some of Wall Street's biggest concerns. Despite a top line revenue miss, Wall Street reacted positively, sending shares higher. Apple, on the other hand, was punished for its recent revenue miss. This comes even though Apple reported 17.6% annual revenue growth, or 27% when factoring in that last year had an extra week to account for the leap year. Google is becoming more like Apple, especially as it branches outside of its key advertising model into other areas. Rumors of Google-branded retail stores, an area where Apple has enjoyed great success, are making the rounds this morning. In addition to potential retail stores, Google is making its own hardware. The Nexus 4 smartphone, as well as the Nexus 7 and Nexus 10 tablets have sold well, but nowhere near Apple's iPhone success. Apple, of course, has been selling hardware for years, first with the iPod, then the iPhone, and now the iPad. It seems as if Google's being rewarded for becoming more like Apple, while Apple is being punished for trying to be more like Google. In fact, Apple CEO Tim Cook even said that Apple isn't a hardware company at a recent tech conference, perhaps trying to change people's perceptions of the tech giant. "Because we're not a hardware Company, we have other ways to make money and reward shareholders," he said. "This doesn't get noticed very much for some reason." Cook pointed out that Apple generated $3.7 billion in revenue from services and software in its most recent quarter. Perceptions of Apple have changed drastically over the past few months. Hedge funds left the stock in droves during the fourth quarter, with big names such as Third Point, Omega Advisors and Jana Partners liquidating their positions. The market is notoriously fickle, and can change on a dime. Apple is no stranger to this phenomenon, something that Google has also experienced. Just don't be surprised if perception changes again sometime in the very near future.